You read that right! It’s fall, so it’s time for my yearly check-up on our favorite recipe, the Chicken Pot-Pie! I have been making, working on, and perfecting this recipe for 7 years now, and it’s just better and better every time. Yesterday, Mitchell and I decided to make one to welcome fall. We are now pescetarian, which means the only “meat” we eat is seafood. We mostly follow a vegetarian diet, with the exception when we eat out, and the occasional splurge where we make seafood at home. So, when I had the idea to make a Veggie pot pie for the blog, as we were gathering the ingredients at the grocery store, we decided to try making one with shrimp and cod! The end result was amazing, and I had to share it with you! This recipe makes 2 pies. 2 Medium or large carrots – washed and chopped to your liking. 2 stalks of celery – washed and diced. A very small pinch of Thyme. 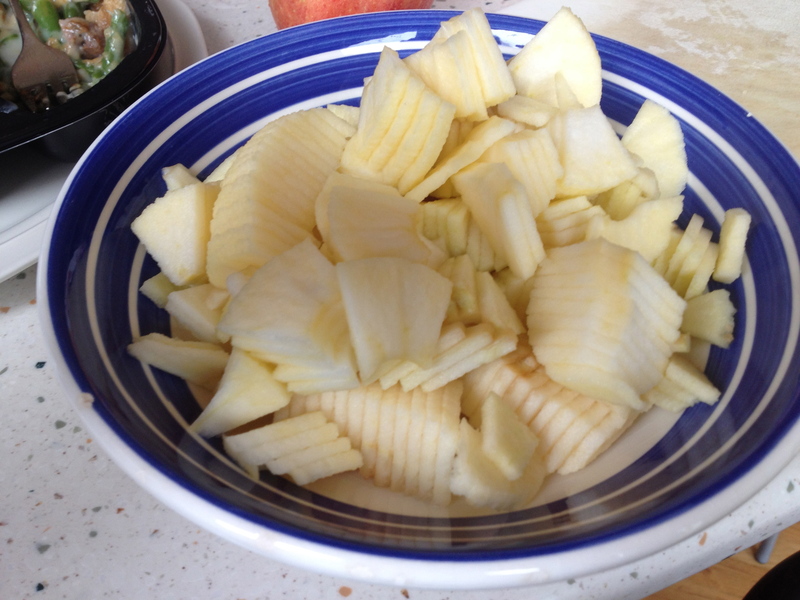 2 Medium or larger potatoes – chopped, not peeled. 2 dozen small shrimp, precooked. 1/2 pound of cod (Or however much or little you prefer). 1/4th a cup of Flour. Put your chopped carrots & potatoes into a medium/large pot with water & cook for about 10 minutes until cooked just enough that you can poke them, but still firm. While your potatoes and carrots are boiling, wash and pat dry your cod. Season with a little salt and pepper. Place your cod in a frying pan that has been warmed with a little bit of oil. Cook thoroughly, take off heat and set aside. Once you’re carrots and potatoes have been cooked, strain them & set them aside. Now add in your seafood stock, Thyme, salt& pepper, (I added my celery now too) boil for 2 minutes. I added my shrimp one minute in. The photo below is after I started adding the carrots. Now it should look like a saucy soup, or stew. Next, you’ll want to mix all the ingredients into the sauce. Stir well. Take your pie crusts & place in your pie plates, pour your ingredients into crust, cover with remaining crust & tossed into the oven for roughly 30 minutes until the crust is a beautiful golden brown. Let the pie rest for about 10 minutes (it’s actually best to let it sit about 15-20 minutes) before cutting into pieces. Serve, and enjoy! Vegan foods and a .com?! While we were in Colorado visiting Lauren we ate a little healthier than we normally do. Actually, during our entire stay, we only had a couple meals that weren’t vegetarian. Since we’ve been back 90% of our meals that I’ve made here at home have been vegetarian. For no reason other than it’s easy, cheaper, and healthy. We aren’t big meat eaters, so it really isn’t that big of a change. Tonight, I decided to experiment a little. I made a vegan pasta dish with meatless “meat” and it turned out amazing. The only thing Mitchell noticed was the noodles not being the “normal” noodle. These were pretty good in my opinion! I used the brand Ancient Harvest, and their pasta was on sale, so I only paid $2.50 for the box, which for gluten free is super cheap! I probably should have grabbed a couple other boxes, but I wasn’t sure how the texture would be. Really truly there wasn’t much difference, though I know picky people would notice the difference. Next, I used the Smart Ground Original. This stuff, was SO delicious! The texture was spot on, and it added great flavor. I will definitely be buying their products again! first I boiled the noodles, and strained them. Sat them aside. Then, I sautéd the meat with some garlic, and spinach, once it was heated and the spinach had the right amount of wilting, I added the sauce, You can use whatever pasta sauce you prefer, mine was just a classic tomato sauce. heat, add the noodles and voila! Ready to consume! Oops! I forgot to add, you can now locate my blog by visiting therealkk.com! The second recipe I tried has show up on my pinterest feed quite a few times since November, so I thought I’d give it a shot. 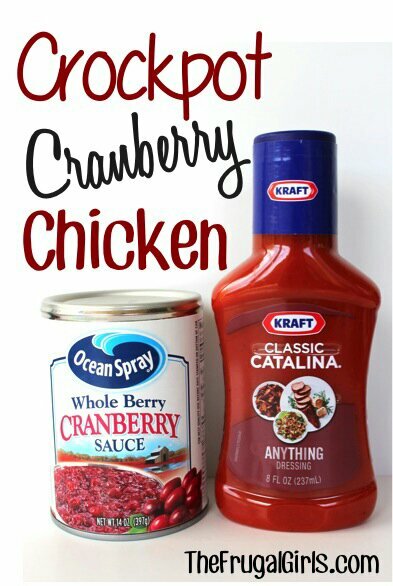 The blog says you’ll need 4 chicken breasts, 1 can whole berry cranberry, 1 package dry onion soup and an 8 oz Catalina dressing. You cook the chicken on high for 3 hours, mix the other ingredients together and poor over the chicken and cook for 30 more minutes. I only cooked 3 chicken breasts, and only used 6 oz of dressing. This dish is VERY SWEET. We felt like there was way too much dressing. Next time we’ll use less dressing (it doesn’t compliment the cranberry very well and adds a weird taste.) Ill probably toss in home made cranberry sauce, it might help. I cooked my chicken on low for 6 hours then on high for and additional 30 with the other ingredients. 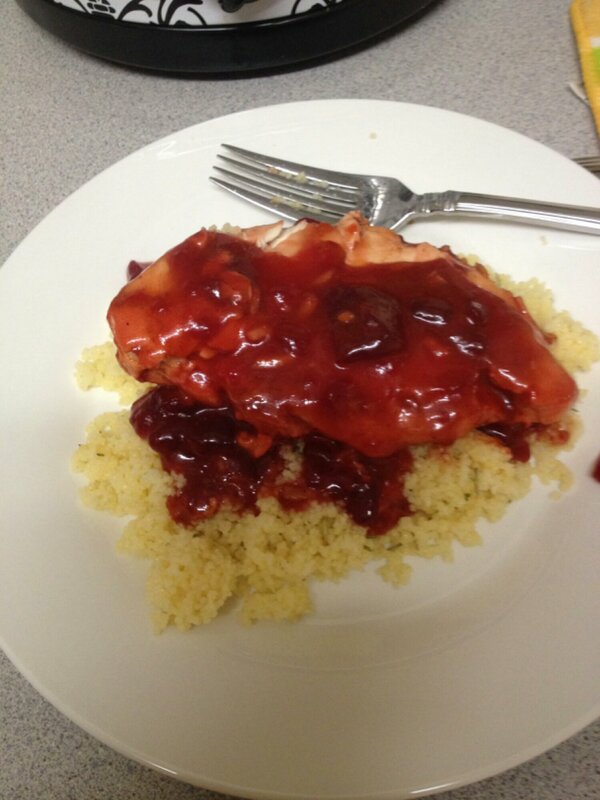 I served this over couscous, that I made with chicken broth and rosemary. My photo is below. This recipe is one that my boss has had for ages. I make it for them about once a week in the autumn/winter, and LOVE eating the left overs the next day. I don’t have any photos for this recipe, since I’ve never made it at home, but I know the recipe by heart and for any/all meat eaters you’ll LOVE THIS! 1 Can of Cream of ANYTHING. Seriously Cream of chicken, mushroom, cheddar, celery… any of it works! Put your chicken (FROZEN) breasts into your crock-pot. Mix together your packet of italian dressing & your 1/2 cup water, pour over chicken. Cover & cook on LOW for 5 hours. This is when I bring the cream cheese out of the fridge & set it on the counter, leave it there until the next step. Next, once you’ve cooked the chicken for 5 hours, mix together your can of cream of whatever, and the cream cheese. Add the mixture to the crock pot & cook on HIGH for 1 hour to 1 1/2 hours. Thats it, once it’s done cooking it’s ready to serve. Serve over rice or egg noodles… or whatever your preference. Serve with a nice green veggie and you’ll have an amazing, easy and delicious dinner! I’ve said it time and time again. I LOVE AUTUMN. Something about the cool air, the rain, the colors… the FLAVORS! Everything about autumn is beautiful… A couple weeks ago I bought all the supplies to make Apple Turnovers… I don’t know what got into me but I haaaad to make them. It’s really simple. These turned out really really tasty. I was too worried and embarrassed to share these with EverSoLightly’s family, even though I had intended them for his dad’s birthday. I saved them and EverSoLightly and I ate them the next day & he raved about them! I had two bowls next to me, one for the bits of the apple that I wasn’t going to keep, and one for the pieces for the turnovers. I was raised to EAT that delicious skin that comes off with the apple peeler corer slicer. If you don’t want to you can use them as compost or put them in your yard waste bin. Once all your apples are cut up and your mess is cleaned up, toss those slices into a pot, pour in your apple juice, and spices to taste… cook cook cook, you want those apple slices to be soft and beautiful. Once your apples are soft, and they taste the way you want, get your puff pastries ready. 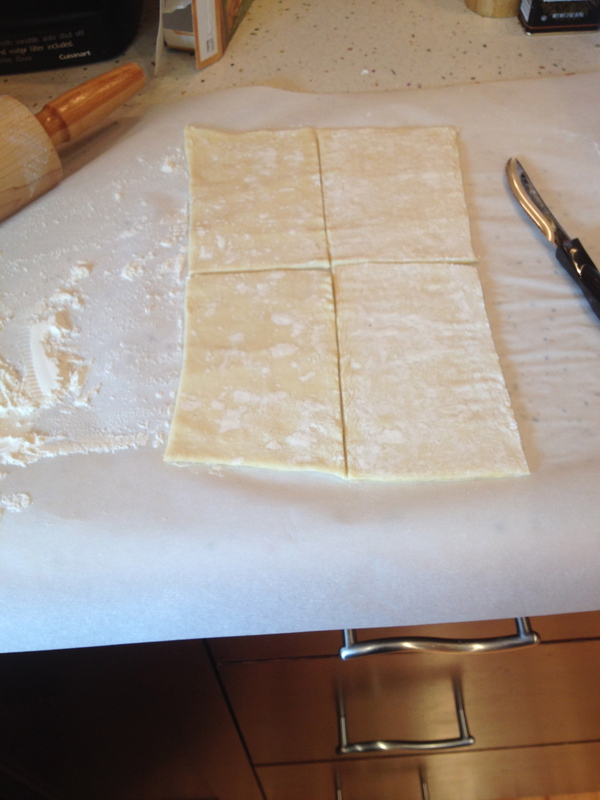 I cut mine into 6 pieces (though only took a picture after I made the first two.) Grease your baking sheet now. Once yours are divided up the way you want, fill them with your delicious apple filling. Close them according to your preference. In a separate bowl, mix one egg with a bit of water, mix. Brush this mixture over the turnovers, and sprinkle with sugar. 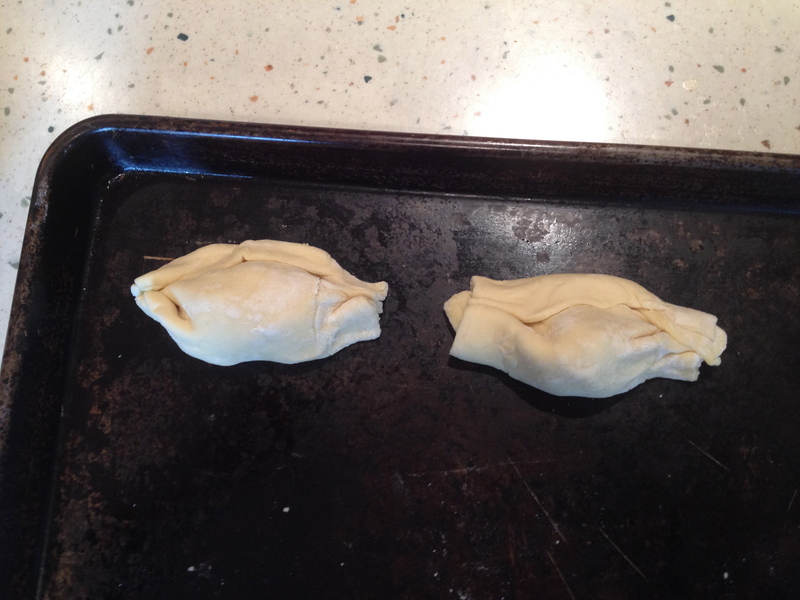 Bake in oven according to Puff Pastry box. Once done, move to a cooling rack & enjoy! Do you have any extra filling? 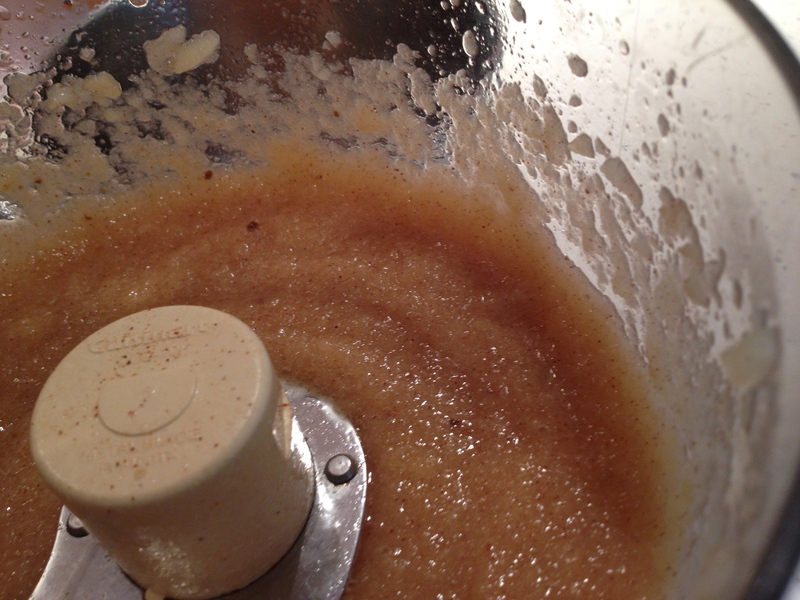 Toss that into your blender, food processor, or whatever you use and turn it into YUMMY apple sauce! Today I’m here to share with you, an amazing apple breakfast bread recipe! I passed a loaf of this along to Mitchell’s parents, and gave some to my neighbor, I don’t know what the Smith’s thought, but our neighbors LOVED it. It’s REALLY EASY and SUPER DELICIOUS. It makes a GREAT breakfast loaf. I think I’ll make this for Christmas. It’s great the day off but even better the day after, heated with butter. Yummmm. Pre-heat oven to 375 and grease your loaf pan. I managed 2 loafs out of this recipe, but it depends on the size of your pan. In a large bowl, cream together butter and sugars. Beat in eggs. Add in flour mixture alternately with cider- I did mine in thirds. Mix until everything is combined, but don’t over mix. 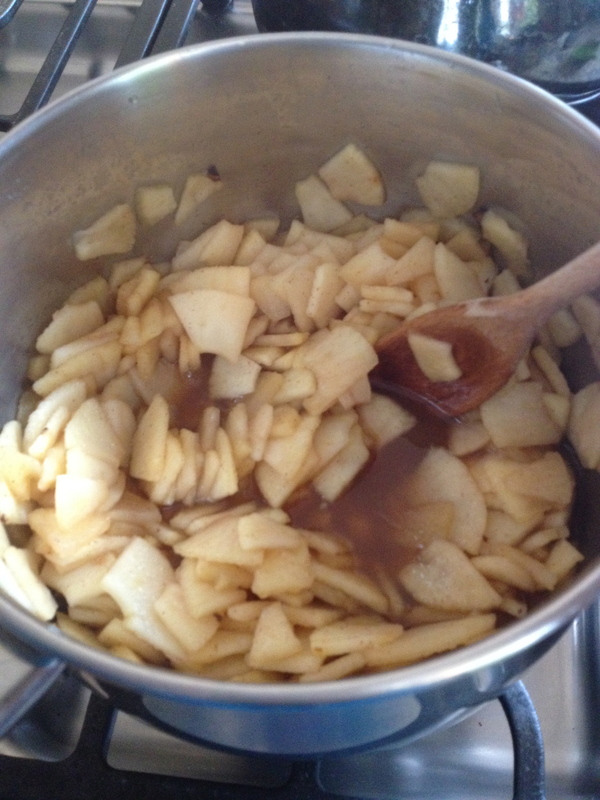 Next gently toss in and stir the apples. Pour batter into loaf pan(s) and place in oven. Bake until toothpick comes out clean. About 50 minutes. Remove from oven and let cool (about 20 minutes) then remove from pan, place on wire rack to finish cooling and either enjoy or wrap up for consumption the next day. I’m warning you now, it is AMAZING. It wont last long!